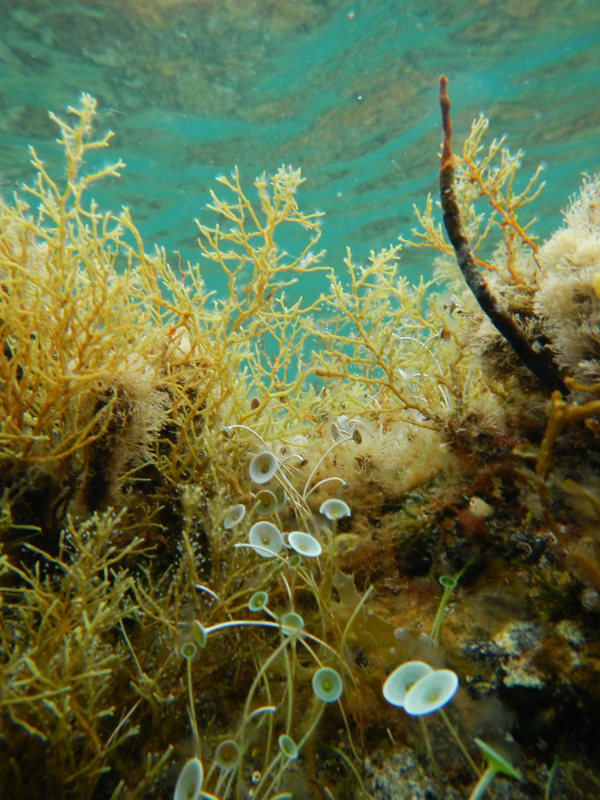 New research from the University of Washington’s Friday Harbor Laboratories shows that a more acidic ocean can weaken the protective shell of a delicate alga. The findings, published Sept. 9 in the journal Biology Letters, come at a time when global climate change may increase ocean acidification. 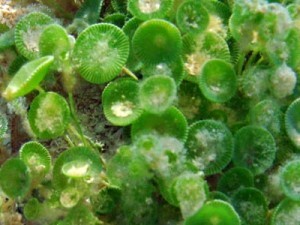 The creature in question is Acetabularia acetabulum, commonly called the mermaid’s wineglass. Reaching a height of just a few inches, this single-celled alga lives on shallow seafloors, where sunlight can still filter down for photosynthesis. Like many marine creatures, the mermaid’s wineglass sports a supportive skeleton made of calcium carbonate. Its skeleton is thought to deter grazing by predators and keep the alga’s thin stem rigid to support the round reproductive structure on top, said UW biology professor and senior author Emily Carrington. 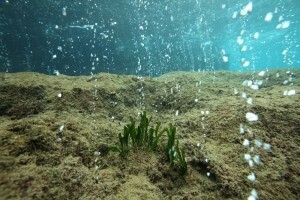 Increasing acidity of ocean water disrupts calcium carbonate levels. The more acidic the water is, the less calcium carbonate is available to living organisms. No studies had shown if even a slight increase in ocean acidity could weaken the shell of the mermaid’s wineglass. But three years ago a colleague told Carrington and UW biology doctoral student Laura Newcomb that the mermaid’s wineglass grows differently in certain parts of the Mediterranean Sea. Carrington and Newcomb, who want to understand how marine organisms adapt to changing environmental conditions, were intrigued by the differences Hall-Spencer reported. 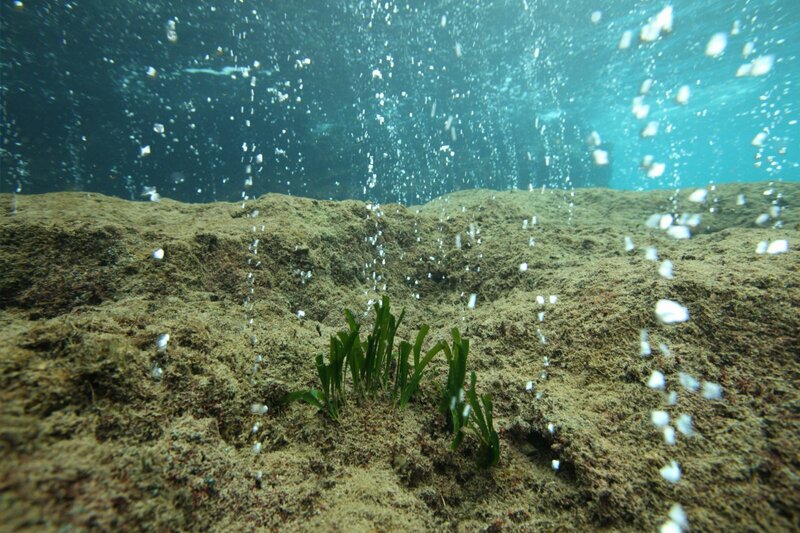 Underwater volcanic activity creates CO2 seeps, which spew gas and minerals into the water column. This includes dissolved carbon dioxide, which makes ocean waters near the vents more acidic. Newcomb wondered if mermaid’s wineglass algae growing closer to the seeps had weaker calcium carbonate skeletons. She measured the composition, morphology and stiffness of preserved algae that Hall-Spencer had collected, and found that algae near the vents were thinner and droopier. But Newcomb and Carrington worried that the preservative the algae had been stored in might have affected the measurements. There was only one thing to do. The CO2 seeps were located near Vulcano, an island off the northern coast of Sicily. Newcomb collected fresh samples of the mermaid’s wineglass — both near and far from the seeps — and measured the carbon dioxide levels of the water at each site. Carbon dioxide levels were five times higher at sites closest to the seeps. The CO2 readings indicated how acidified the water is at each site — the more carbon dioxide, the more acidified. The high carbon dioxide levels affected the composition and flexibility of mermaid’s wineglass skeletons. Newcomb found that near seeps in high carbon dioxide conditions, mermaid’s wineglass skeletons contained 32 percent less calcium carbonate. As a result, the straw-like stems were 40 percent less stiff and 40 percent droopier than their counterparts from low carbon dioxide waters. “We saw a big loss in skeletal stiffness with even a small increase in carbon dioxide,” said Carrington. Newcomb and Carrington hypothesize that the less fortified mermaid’s wineglass algae might be more susceptible to damage from ocean currents and grazing by marine animals. Their droopy posture may also make it difficult to disperse offspring. 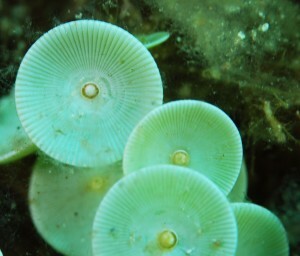 On the other hand, the thinner skeletons may transmit more sunlight to make food, and neither Newcomb nor her co-authors found snails — a common wineglass muncher — near the CO2 seeps. Carrington and Newcomb hope that field studies like these, which look at the mechanical function of the calcium carbonate skeletons and not just their composition, will help biologists and oceanographers understand how climate change could affect creatures like the mermaid’s wineglass. Newcomb, Carrington and Hall-Spencer were joined on the paper by co-author Marco Milazzo from the University of Palermo. 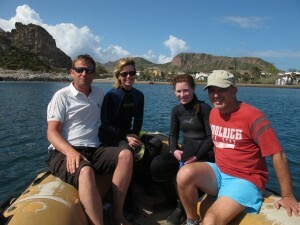 This study was funded by the National Science Foundation (EF-1041213) and the Mediterranean Sea Acidification Program. For more information, contact Carrington at 201-221-4676 or ecarring@uw.edu and Newcomb at the same phone number or newcombl@uw.edu.